There are a number of varieties of corn, some used for feed and others for milling. Popcorn is a variety unto itself. For the purposes of cooking corn, or corn on the cob, most recipes use only sweet corn. Interestingly, Native Americans didn't eat much of this corn, finding it to be too sweet and the texture too creamy. Most people think of corn as a vegetable, but it's actually a whole grain. Like wheat or rice, corn has a lot of fiber, good quality fats, and carbohydrates. I like to make my corn chowder with russet potatoes. The waxy red potatoes will not thicken a soup as well as the more fragile russets, which will break down slowly to make the soup creamy. In just six weeks, Dr. Tim Harlan will take the guesswork out of eating healthy with dozens of easy, delicious recipes. 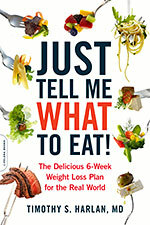 Find out more about Just Tell Me What to Eat! - just $15.00 + s/h!